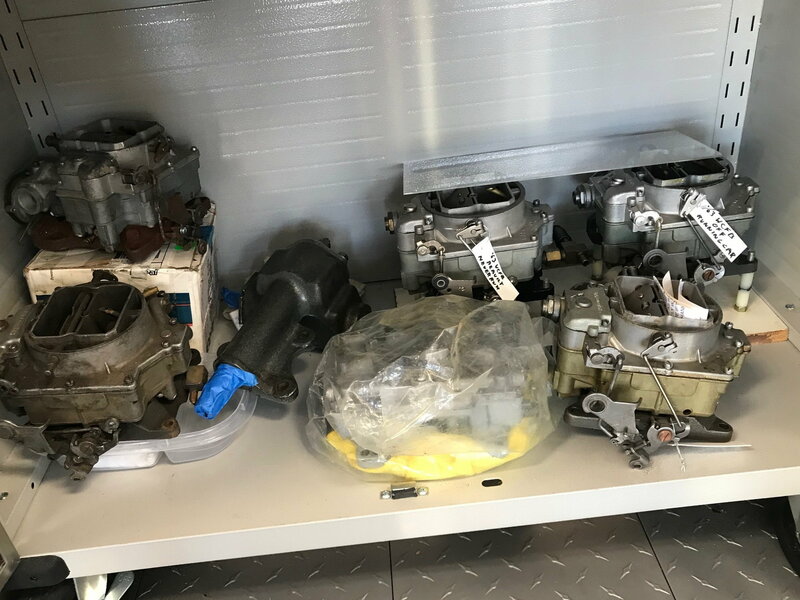 Getting organized to restore 2x4 245 HP WCFB carbs. Only items I cannot locate are the four low speed jets and one vacuum piston. Looking for sources beyond Chicago Carbs, Carbs Unlimited and Mike's Carbs. Talk to Ron or Tim at Daytona Parts. No luck with Daytona but they suggested Chuck Smith. Sent him email hoping he can help. Suspecting these needle jets and the piston are going to be extremely difficult to find. Last edited by tgtexas02; 01-07-2019 at 10:26 AM. Last edited by L78racer; 01-07-2019 at 07:55 PM. we have used them. they work good. they are correct sizes though not intricately labeled as originals are. When you say "low speed jets" are you referring to the primary jets or the idle restriction tubes? If you need the jets I purchased these when I did my friends carbs. 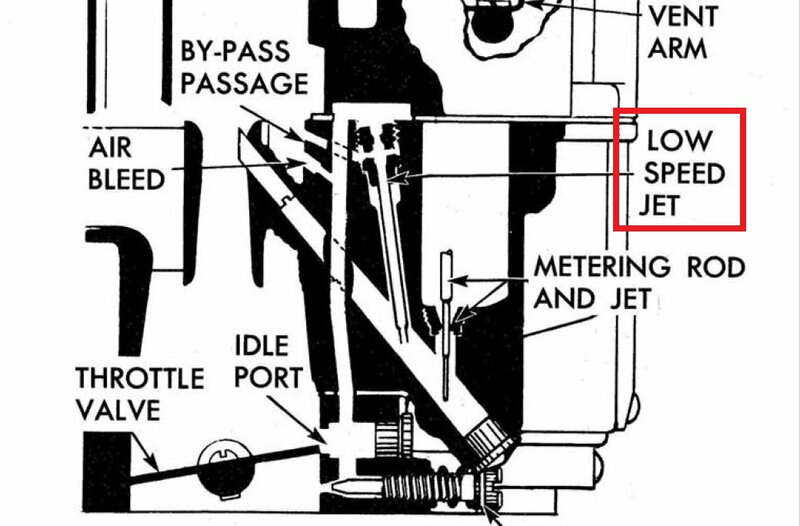 I got the title low speed jets from a carbs unlimited parts diagram-the tops look like the regular jets but they have a long screw in needle on them. And they screw into the top of the main body at an angle. There are a total of eight of the regular jets (which are pretty available) but only four of these "needle" jets which are about 1 1/2" long and apparently elusive. I have an accel piston that I can rob from my perfect 2626S 230 HP shelf carb but hate to leave this carb ruined. Somebody some day will want it. 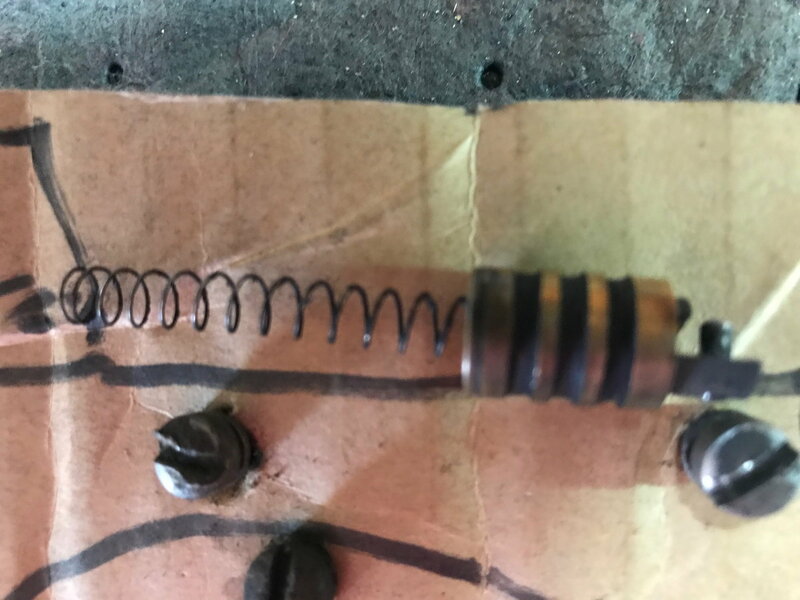 This 2x4 restoration is my first effort on coloring and rebuilding carbs which doesn't seem that complicated as long as you can get all the correct parts. So, I really need any help from all you carb smart guys. Hey, I am not stupid. I am just dumb. Last edited by tgtexas02; 01-08-2019 at 09:03 AM. Last edited by Frankie the Fink; 01-08-2019 at 09:16 AM. I'm also not sure what is meant by "low speed jet". On an AFB primary side there is a main jet/metering rod in each bowl, and an idle jet that is integral with the primary venturi cluster. On the secondary side their is just a main jet. The main jets are replaceable, but changing the idle jet requires a different primary venturi cluster with the desired idle jet size. Early small block AFBs have a .035" idle jet, but later versions beginning with (I think) the 3721S are .037". I believe the WCFB fuel metering architecture is the same as the AFB, but not sure. The low speed jet is 1 5/8" long, the tip is flat and should be hollow (this one clogged with rock hard crude), and the top has stamping for sizing (17 and 3025). Frankie, you convinced me to put this little puppie back in and leave the other three alone which won't budge. The black appears to be a special coating and they are hollow. This one is clogged and betting the others are same. The stuff is rock hard. I will just have to make sure they really are cleaned and unclogged. All your tips are really helping by slowing me down and causing me to think much harder before I do something really stupid. Duke, I barely understand the WCFB let alone the AFB. But, some of the small parts such as jets might be interchangeable if sized right? Does the AFB use a needle valve/jet screw like this "low speed jet"? In third pic, this low speed jet reads 17 and 3025. Thinking the 3025 means .025? There are "grades" of carb cleaner with varying degrees of aggressiveness. You might try to get some of the more caustic stuff just for those jets. I'm not a fan of poking around in them but it might be necessary if you're REAL careful... E.g. a thin piece of wire. Sometimes those jets, along with the man bowl "floor" jets can literally weld themselves to the carb body... If they won't move with a correct sized screwdriver and some azz applied to the screwdriver LEAVE them alone... I think you should stick in the WCFB realm, I don't know how much of the AFB is interchangeable and I wouldn't want to experiment. Last edited by Frankie the Fink; 01-08-2019 at 11:37 AM. Frankie, yes it is the brass piston below the "T" bar. 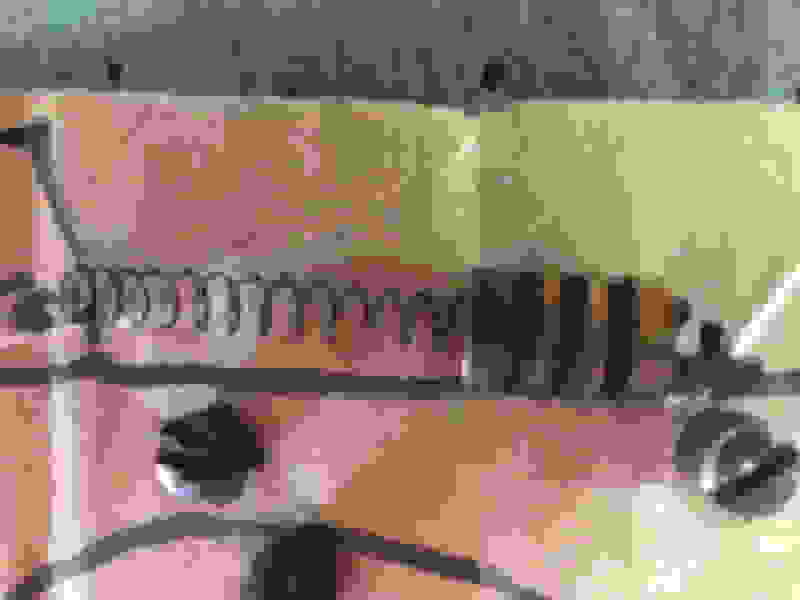 If you have one and the spring below it I won't have to cannibalize a great looking base hp carb. Just let me know how much you need for it and I'll send you the money to include enough to buy a beer or two. I don't mean to continue to drag this drama out but (mind recall is not good in this old head), rear main body had both of the low speed jets of which one I easily removed but will put back in. After rechecking my frt main body, I just noticed that both low speed jets are actually missing. That is going to be a real problem I am thinking! This is why I was wondering about AFB interchange? Might be the only possible way out for me without buying another high cost donor/replacement carb, So, I feel compelled to research this. Last edited by tgtexas02; 01-08-2019 at 11:53 AM. I'm neck deep right now in trying to find a freon leak in my Vintage Air aftermarket A/C system...grrrr. Take care of your problem. I am also going off air for a while as I just was delivered my three new 6'x6' living room windows--thanks to a friendly ignorant, stupid deer! Guess he couldn't tell the difference between open air yard and a house. Last edited by mrnisguy; 01-09-2019 at 08:58 AM. Bob, I do need some direction and I will call you today to see what services you might offer. I'm looking at my 1963 Corvette Shop Manual and it shows a replaceable "low speed jet", so it's NOT like the AFB that has low speed/idle jets integral with the primary venture clusters. Sorry, I should have looked before my previous post, but I'll venture to guess that WCFB and AFB/AVS jets and rods are not interchangeable. It's interesting that the WCFB appears to have more parts and is slightly more complicated than the AFB, which means the WCFB was probably more expensive to manufacture. Then why was the 300 HP engine an extra cost option? Though they had different heads and inlet manifolds the difference in manufacturing costs of those different parts was probably insignificant. I guess it's called... marketing. It made sense that the 250 HP engine was dropped and the 300 HP engine became standard. With all the chemicals that have been banned over the last several decades, it's tough to find a good carb cleaner... so whatever anyone else with recent experience recommends... but soaking them in acetone might work. Those jets are listed at .031", so if you can get the deposits softened, a thin piece of wire, like no more than .025" diameter might help dislodge them. Last edited by SWCDuke; 01-09-2019 at 11:10 AM.